The Samsung Galaxy Tab S4 has been in the rumors for a while now. The upcoming tablet is the successor to the Samsung Galaxy Tab S3, which was launched in February 2017 with the Qualcomm Snapdragon 820 system-on-chip. 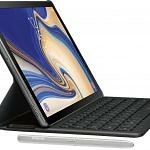 We have seen the Galaxy Tab S4 receive FCC certification, and a report has stated that it will have support for Samsung DeX. We have also seen a leaked press render of the device. Now, Evan Blass has leaked another render of the Galaxy Tab S4, showing a white model with black front bezels. The render also shows the tablet’s S Pen in white color and a keyboard accessory. On the surface, the Galaxy Tab S4 will have some major changes as compared to its predecessor. Reports have stated that it may have a 10.5-inch display, and the render posted by Mr. Blass seems to point to the fact that it will have a 16:10 display, while previous Galaxy Tab S tablets had 4:3 displays. The tablet does not seem to have a fingerprint sensor, unlike the Apple iPad. The render shows that the white model of the Galaxy Tab S4 will still have a black front, which is good to see as white bezels can be a distraction. Once again, we note the absence of a home button on the device. The tablet will instead have onscreen navigation. It’s worth noting that other upcoming tablets such as the Galaxy Tab Advanced 2 will also lack the home button. Other rumored specifications of the Samsung Galaxy Tab S4 are the Qualcomm Snapdragon 835 SoC, 4GB of RAM paired with 64GB of storage, 13MP rear camera, 8MP front-facing camera, 7,300mAh battery, and Android 8.1 Oreo. As of now, the tablet’s launch date is still unknown, but a launch at IFA 2018 seems probable. The Samsung Galaxy Note 9, on the other hand, will launch on August 9.